Minimum order size 50 grams. Click here to request a quote. Huge discount for bulk order! Purity>98%. Our PhD scientists produce this product from our world-class laboratory. We provide USA based shipping, customer services and technical support. We run a price match program to ensure the very competitive prices. Contact us for COA, MSDS and Tech Data Sheet. 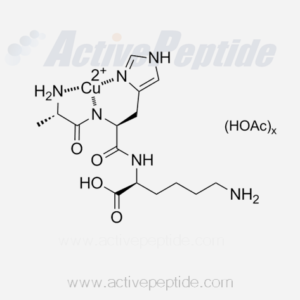 Request a Quote for AHK-Cu to receive a prompt response from Active Peptide Company. Other Names: Copper Tripeptide-3; Ala-His-Lys Cat No. AP103003. 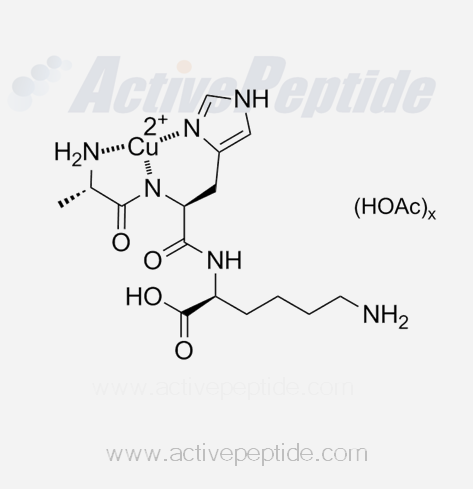 AHK-Cu is an analogue of GHK-Cu which had a stronger effect for hair growth. While AHK-Cu is used in skin-care, it is generally used more for both scalp and hair care than GHK-Cu. This product is pure powder with purity >98%. No excipients, preservatives, anti-oxidants present, or used during the manufacturing process. It is 100% synthesized in laboratory so not involved with plant, vegetable, or marine. It is neither palm derived nor sustainably sourced.